— Geeks on Tour is member supported. This FREE newsletter is made possible by our paid (Premium) members. Member benefits include access to over 400 tutorial videos, asking questions on ‘Ask the Geeks’ form, Show Notes for our weekly show, “What Does This Button Do?” and all our eBooks including Mrs Geek’s Guide to Google Photos. Nowhere is better than South Florida in January. 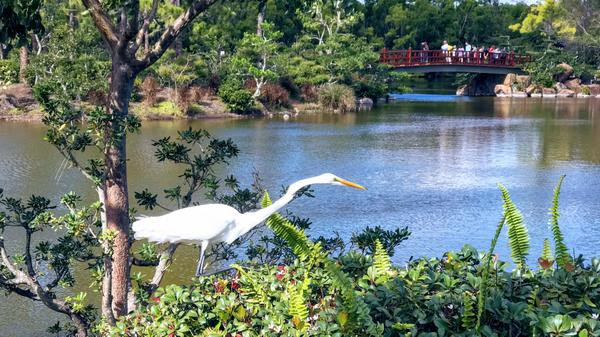 The photo above is from Morikami Gardens. ​​​​​​​After some restful holidays, we went back to work presenting seminars at Computer Clubs in our area, doing our “What Does This Button Do?” YouTube shows, and working on our website. See our January photo album for more pictures, and our Blog for the rest of the story. We’re in the RV and on the road all around Florida. We’re presenting seminars this week for the Discovery Owners Association. 1/28 to 2/3 Discovery Owners Southeast Region Rally at Lazy Days, Seffner, FL. How can recipients save an entire album? Google Maps is our Go-To app for any question that starts with “Where …” This article tells you how to find out where the bicycle trails are near you. See Street View of the trails. If you take a lot of photos and wish that they were all together and safe so you never had to worry about them – Google Photos is truly the best option. I wrote a book about Google Photos. It’s titled Mrs. Geek’s Guide to Google Photos. The subtitle is “Your lifetime of photos, effortless and free.” I keep thinking, if Google Photos is so effortless, why do I need a 100+ page book to teach how to use it? I’ve come up with these 14 points as all you really need to know. So many of us use Facebook all the time. We’ve just kind of jumped in and started posting and don’t understand the structure of the system. We think you’ll get more out of it if you do understand a bit. There are 4 distinct parts to Facebook. ​​​​​​​We were guests on the YouTube show of Michael Daniels and The topic was Facebook Basics, and making a Facebook group. If you’ve ever wondered about making your own group, that’s exactly what we did as part of this video.